Download "Enforcement - Aggressively Attacking Unlawful Drug Activity. Treatment/Recovery - Getting Treatment Resources Where They Are Needed"
1 Orange County Drug Free Coalition Strategic Plan Mission Statement: To engage, advocate, inform and bring awareness of alcohol and other substance abuse issues through education, prevention, enforcement, and treatment to build a healthy, safe and drug free community. 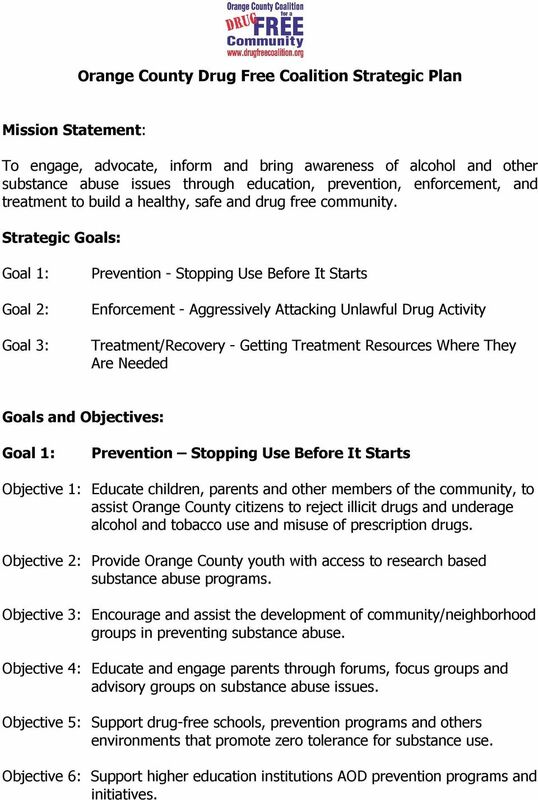 Strategic Goals: Goal 1: Goal 2: Goal 3: Prevention - Stopping Use Before It Starts Enforcement - Aggressively Attacking Unlawful Drug Activity Treatment/Recovery - Getting Treatment Resources Where They Are Needed Goals and Objectives: Goal 1: Prevention Stopping Use Before It Starts Objective 1: Educate children, parents and other members of the community, to assist Orange County citizens to reject illicit drugs and underage alcohol and tobacco use and misuse of prescription drugs. 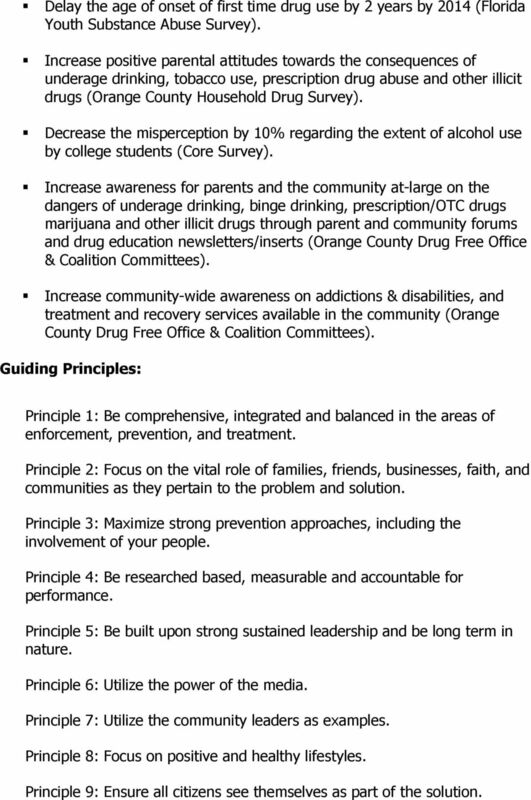 Objective 2: Provide Orange County youth with access to research based substance abuse programs. Objective 3: Encourage and assist the development of community/neighborhood groups in preventing substance abuse. Objective 4: Educate and engage parents through forums, focus groups and advisory groups on substance abuse issues. Objective 5: Support drug-free schools, prevention programs and others environments that promote zero tolerance for substance use. Objective 6: Support higher education institutions AOD prevention programs and initiatives. 2 Objective 7: Work with the electronic and print media on awareness of prevention activities and events. Objective 8: Collaboration with community partners, government entities, sports organizations, business and faith groups to encourage prevention efforts in the community. 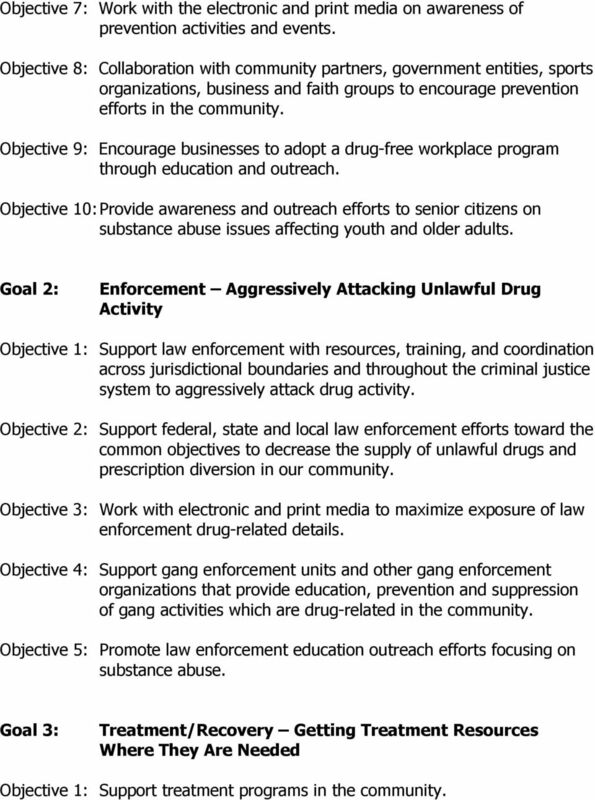 Objective 9: Encourage businesses to adopt a drug-free workplace program through education and outreach. Objective 10: Provide awareness and outreach efforts to senior citizens on substance abuse issues affecting youth and older adults. Goal 2: Enforcement Aggressively Attacking Unlawful Drug Activity Objective 1: Support law enforcement with resources, training, and coordination across jurisdictional boundaries and throughout the criminal justice system to aggressively attack drug activity. Objective 2: Support federal, state and local law enforcement efforts toward the common objectives to decrease the supply of unlawful drugs and prescription diversion in our community. Objective 3: Work with electronic and print media to maximize exposure of law enforcement drug-related details. Objective 4: Support gang enforcement units and other gang enforcement organizations that provide education, prevention and suppression of gang activities which are drug-related in the community. Objective 5: Promote law enforcement education outreach efforts focusing on substance abuse. Goal 3: Treatment/Recovery Getting Treatment Resources Where They Are Needed Objective 1: Support treatment programs in the community. 3 Objective 2: Provide awareness of faith-based treatment programs available in the community. Objective 3: Educate parents, faith leaders, and other community members on treatment programs available for youth and adults. Objective 4: Provide awareness of recovery programs and activities in the community. Objective 5: Work with the electronic and print media on promoting awareness on treatment availability and resources in the community. Objective 6: Explore specific treatment needs and facilities available for persons with disabilities. Performance Measures: Reduce the reported use of alcohol and other drugs among our youth by 5% in Orange County by 2014 (Florida Youth Substance Abuse Survey). Reduce the reported use of heavy alcohol use and binge drinking by youth ages by 5% in Orange County by 2014 (Core Survey). Increase the number of coordinated state and local law enforcement alcohol compliance checks in Orange County by 10% in 2012 (AB&T and Local Law Enforcement Arrest Data). Increase the number of clients that successful completes the Orange County Adult Drug Court Program by 5% in 2014 (Orange County Adult Drug Court Program). Conduct and participate in 50 educational presentations, forums and trainings, media contacts in the community on prevention of alcohol, prescription/otc and other drug use among youth and young adults (Orange County Drug Free Office & Coalition Committees). Provide 10 presentations to Orange County employers on How To Become A Drug Free Workplace by 2012 (Drug-Free Workplace Committee). Decrease drug abuse in the workplace by 10% by 2014. 4 Delay the age of onset of first time drug use by 2 years by 2014 (Florida Youth Substance Abuse Survey). Increase positive parental attitudes towards the consequences of underage drinking, tobacco use, prescription drug abuse and other illicit drugs (Orange County Household Drug Survey). Decrease the misperception by 10% regarding the extent of alcohol use by college students (Core Survey). Increase awareness for parents and the community at-large on the dangers of underage drinking, binge drinking, prescription/otc drugs marijuana and other illicit drugs through parent and community forums and drug education newsletters/inserts (Orange County Drug Free Office & Coalition Committees). Increase community-wide awareness on addictions & disabilities, and treatment and recovery services available in the community (Orange County Drug Free Office & Coalition Committees). Guiding Principles: Principle 1: Be comprehensive, integrated and balanced in the areas of enforcement, prevention, and treatment. Principle 2: Focus on the vital role of families, friends, businesses, faith, and communities as they pertain to the problem and solution. Principle 3: Maximize strong prevention approaches, including the involvement of your people. Principle 4: Be researched based, measurable and accountable for performance. Principle 5: Be built upon strong sustained leadership and be long term in nature. Principle 6: Utilize the power of the media. Principle 7: Utilize the community leaders as examples. Principle 8: Focus on positive and healthy lifestyles. Principle 9: Ensure all citizens see themselves as part of the solution. 2012 Grant Application Drug-Free Noble County (DFNC) Please submit 1 master copy and 6 typed copies of the grant proposal in person, to the address below, no later than Thursday, October 27, 2011, 3:00pm. NEW HAMPSHIRE DRUG CONTROL UPDATE. This report reflects significant trends, data, and major issues relating to drugs in the State of New Hampshire. Colleen D. Hughes Executive Director. Monessen Municipal Complex 1 Wendell Ramey Lane Monessen, PA 15062. 724-684-9000 ext. 4446. www. wedacinc. UNIVERSITY OF MARYLAND BALTIMORE COUNTY SUBSTANCE ABUSE POLICY AND CAMPUS PLAN The use of controlled substances and the abuse of alcohol present a serious threat to individual health and everyone s safety. Statistical Snapshot of Underage Drinking Alcohol consumption and dangerous patterns of drinking are widespread among adolescents and lead to many adverse consequences for underage drinkers and others. 1. University functions at which use of alcohol is approved. University of Michigan-Flint Alcohol and Other Drugs (AOD) Policy 2013-2014 Introduction The University of Michigan-Flint, is committed to providing a safe, healthy learning community for all its members. DRUG PREVENTION PROGRAM This is to inform you of the requirements of the Drug-Free Schools and Communities Act Amendments of 1989 Public Law 101-226 and what our schools require of the Staff and the Students. NC Perinatal & Maternal Substance Abuse Initiative NC Division of MH/DD/SAS Community Policy Management Best Practice Team Starleen Scott Robbins, LCSW Illicit drug use among pregnant women in the U.S.